The Sovyet Union haed its springheid in the Roushie Revolution o 1917, whilk owerthrew the Roushie Empire. The Bolsheviks, the majority faction o the Social Democratic Labour Pairty, led bi Vladimir Lenin, then led a seicont revolution whilk owerthrew the provisional govrenment an establishit the Roushie Socialist Federative Sovyet Republic (renamed Roushie Sovyet Federative Socialist Republic in 1936), beginnin a civil war atween pro-revolution Reds an counter-revolution Whites. The Reid Army entered several territories o the umwhile Roushie Empire, an helpit local Communists tak pouer throu soviets that nominally actit on behauf o wirkers an peasants. In 1922, the Communists wis victorious, formin the Sovyet Union wi the unification o the Roushie, Transcaucasian, Ukrainian, an Byelorussian republics. Follaein Lenin's daith in 1924, a troika collective leadership an a brief power struggle, Joseph Stalin came tae power in the mid-1920s. As a result, the kintra dreed a period of rapid industrialisation an collectivisation whilk laid the basis for its later war effort an dominance efter World War II. Housomever, Stalin establishit poleetical paranoia, an introduced arbitrary arrests on a massive scale efter whilk the authorities transferred mony bodies (military heid anes, Communist Pairty members, ordinary ceetizens alike) tae correctional labour camps or justifeed thaim. In the beginnin o World War II, efter the United Kinrick an Fraunce rejected an alliance wi the Sovyet Union again Nazi Germany, the USSR signed a non-aggression pact wi Germany; the treaty delayed confrontation atween the twa kintras, but wis disregardit in 1941 whan the Nazis invaded, openin the lairgest an bloodiest theatre o war in history. Sovyet war casualties accounted for the heichest proportion o the conflict in the cost o acquiring the upper haund ower Axis forces at intense battles such as Stalingrad. Sovyet forces eventually captured Berlin in 1945, inflictin the vast majority o German losses. The territory owertaen bi the Sovyet Union frae Axis forces in Central an Eastern Europe became satellite states o the Eastern Bloc. Ideological an poleetical differences wi Wastern Bloc counterparts direct bi the Unitit States led tae the formation o Comecon an the Warsaw Pact, culminatin in the prolonged Cauld War. 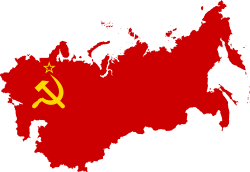 Follaein Stalin's deith in 1953, a period o moderate social an economic liberalization, kent as "de-Stalinization" an "Khrushchev Thaw", occurred unner the admeenistration o Nikita Khrushchev. The Sovyet Union then continued an initiate significant technological achievements o the 20t century, includin launching the first ever satellite an the warld's first human spaceflicht, whilk led it intae the Space Race. The 1962 Cuban Missile Crisis merked a period o extreme tension atween the twa superpowers, considered the closest tae a mutual nuclear confrontation. In the 1970s, a relaxation o relations followed, but tensions resumed when the Soviet Union deployed troops in Afghanistan at the request o its new socialist govrenment in 1979. The campaign drained economic resoorces an dragged on athoot achievin meaningfu poleetical results. In the late 1980s, the last Sovyet leader, Mikhail Gorbachev, socht tae reform the Union an muive it in the direction o Nordic-style social democracy, introducin the policies o glasnost an perestroika in an attempt tae end the period o economic stagnation an democratise the govrenment. Housomever, this led tae the rise of strongnationalist an separatist movements. Central authorities initiate a referendum, boycott bi the Baltic republics, Armenie, Georgie, an Moldovæ, whilk result in the majority o pairteecipatin ceetizens votin in favour o preservin the Union as a renewed federation. In August 1991, a coup d'état wis ettilt bi hardliners again Gorbachev, wi the intention o reversin his policies. The coup failed, wi Roushie Preses Boris Yeltsin playin a heich-profile role in facin doun the coup, resultin in the bannin o the Communist Pairty. On 25 December 1991, Gorbachev resigned an the remainin twal consteetuent republics emerged frae the dissolution o the Sovyet Union as independent post-Sovyet states. The Roushie Federation (umwhile the Roushie SFSR) assumed the Sovyet Union's richts an obligations an is recognised as its continued legal personality. This page wis last eeditit on 4 September 2018, at 02:40.